Now recognised as a major problem for public health and development all over the world, intimate partner violence (IPV) causes suffering, disempowers women, promotes male dominance, breaks national laws and is associated with increased HIV risk. More evidence is needed on the best ways to prevent and reduce this violence. 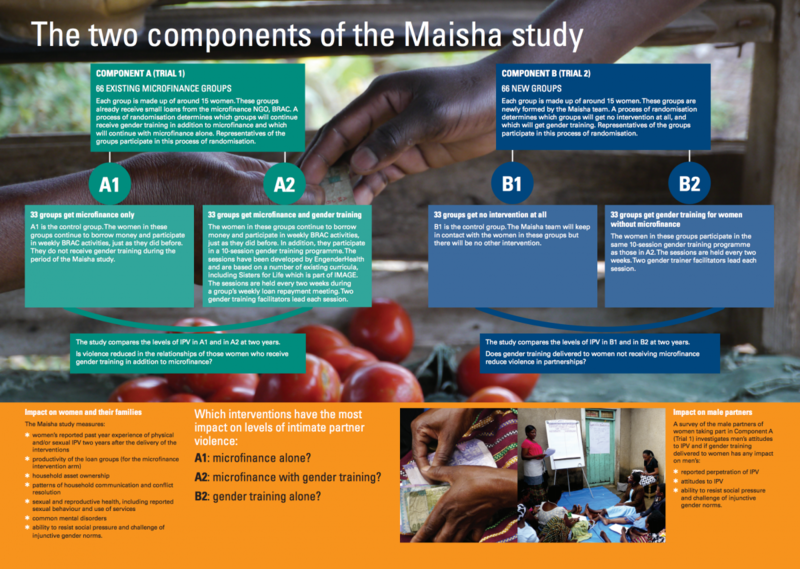 The Maisha study evaluates different components of an intervention designed to support healthy relationships, free from IPV. 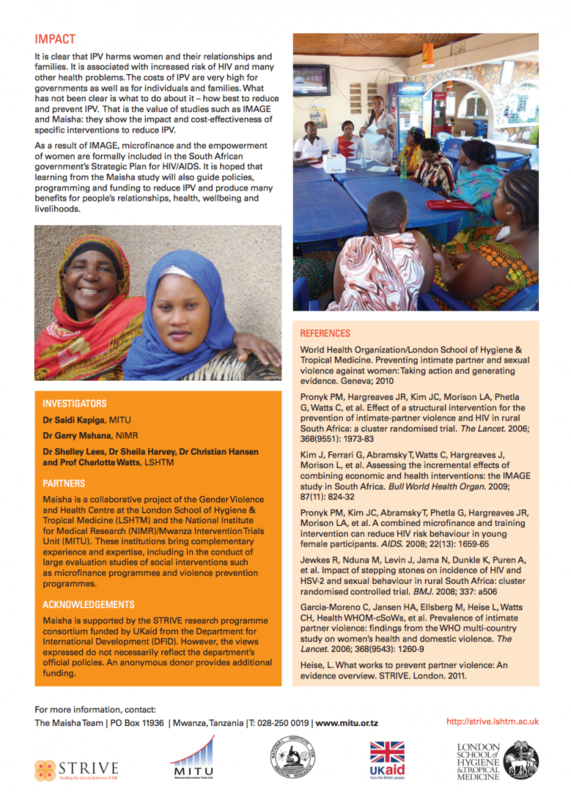 This brochure outlines the study’s foundation, evaluation and impact, and is available in English and Swahili. 33 groups get microfinance only: A1 is the control group. The women in these groups continue to borrow money and participate in weekly activities, just as they did before. They do not receive gender training during the period of the Maisha study. 33 groups get microfinance and gender training: The women in these groups continue to borrow money and participate in weekly activities, just as they did before. In addition, they participate in a 10-session gender training programme. The sessions are held every two weeks during a group’s weekly loan repayment meeting. Two gender training facilitators lead each session. 33 groups get no intervention at all: B1 is the control group. The Maisha team will keep in contact with the women in these groups but there will be no other intervention. 33 groups get gender training for women without microfinance: The women in these groups participate in the same 10-session gender training programme as those in A2. The sessions are held every two weeks. Two gender trainer facilitators lead each session. Is violence reduced in the relationships of those women who receive gender training in addition to microfinance? 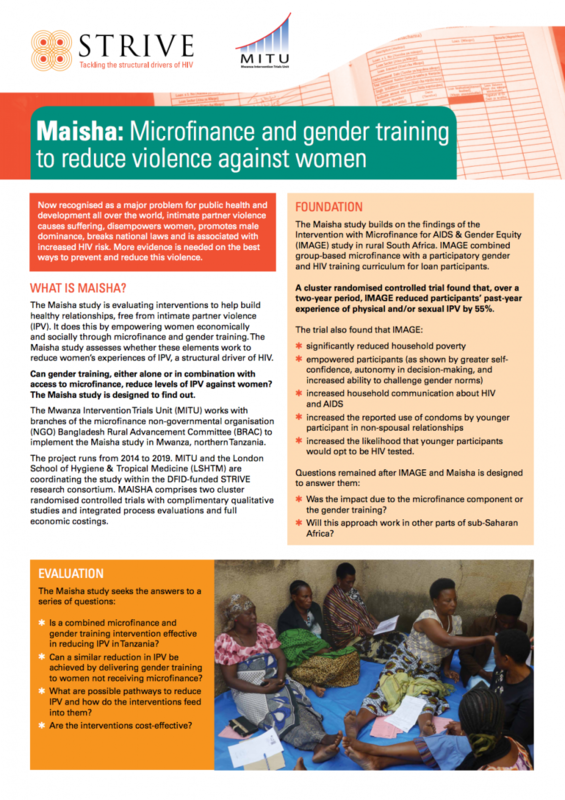 Does gender training delivered to women not receiving microfinance reduce violence in partnerships? It is hoped that learning from the Maisha study will guide policies, programming and funding to reduce IPV and HIV risk, as well as benefitting people’s relationships, health, wellbeing and livelihoods. Download the brochure in English. Download the brochure in Swahili. Watch a short documentary about Maisha.